We'll help keep your virtual Origami skills above the fold. Paperama is a new origami game for Apple and Android platforms from FDG Entertainment, the publisher behind Oceanhorn, Clear Vision and Banana Kong. Paperama delivers a game where the player is engaged in the art of Origami with the simple goal of folding a piece of paper into one of a number of different shapes within a limited amount of folds. Your score ranges based on accuracy of each fold. We're going to give you some tips and strategies for using the lines between the folds. How do I Play Paperama? Fold the paper along the dotted lines into the outlined shape. The challenge is to manipulate the folds within enough moves to get the desired shape without having any excess paper left over the dotted lines. 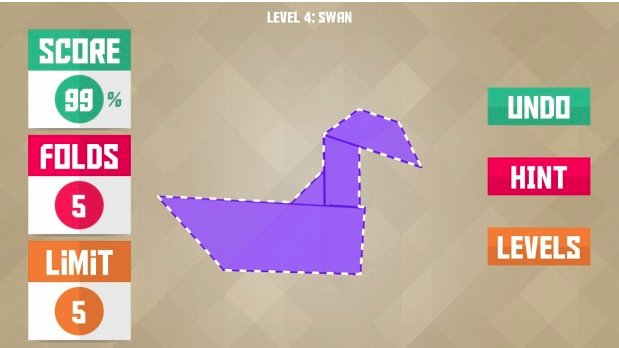 Origami is an art, and if you're interested in obtaining the highest score possible for each level, then precision is necessary but not required. To get a passing grade of one star, you need to fill up 80 percent of the outlined shape displayed on the screen. The accuracy of your folds help to increase your star rating and 100 percent score for the level. If your folds are slightly off, you can always undo them at no penalty and refold for better accuracy. Do you best and try to go for 100 percent, which will give you three stars. How do I get three stars and score 100 percent on every level in Paperama? Origami takes patience, so be happy that the virtual version makes it easier for you to correct your mistakes. A simple way to get three stars and 100 percent on every level is to pay attention to your fold limit. 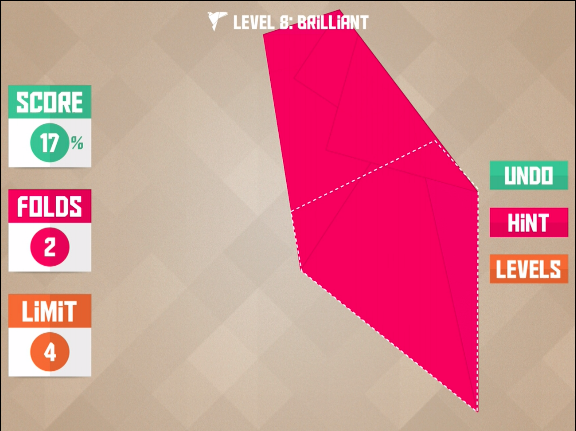 Each level gives you a certain amount of folds to complete the outlined shape. Look at the outlined shape and count the sides. If the number of sides match the folds, then you have an easier time of figuring out how to fold the paper into the desired shape. Once you've figured out the folding pattern to produce the outlined image, make sure your folds are accurate by making folds on the dotted lines. Each accurate fold will bring you closer to getting three stars and a perfect score. How do I figure out the fold pattern in Paperama? As you progress in game, the fold pattern to the outlined shape won't be as obvious, but you have a few options to help you in your challenge to fold the paper into the desired shape. One method is to try to eliminate the biggest amount of paper in each fold; reducing the amount of paper you have to work with can lead to the desired results. If you're stuck in your tracks, you can always use the Hint feature provided within the game. Hints will make the correct fold for you, and lead you in the direction of obtaining the desired shape. Once you run out of hints, additional Hints will cost money. If you're out of Hints and don't want to pay for any, you can always do a Google search. Search for the following keywords "Origami (shape) tutorial" , to get information on how to complete each level and you will find the answer immediately. Searching for, "Origami Hammer Tutorial" will get you the answer to level 23. How do I get free Hints in Paperama? We've encountered one way to get free hints. Earlier within the game, you'll see a pop-up that asks you to rate the game; rating the game will earn you three free hints. The game will take you into the App Store, and if you decide not to rate the game, you'll get the free hints regardless. How much does it cost to play Paperama? Paperama is free-to-play with micro-transactions for Hint purchases; three Hints for $0.99 or 10 Hints for $1.99. Can I play Paperama with my friends? 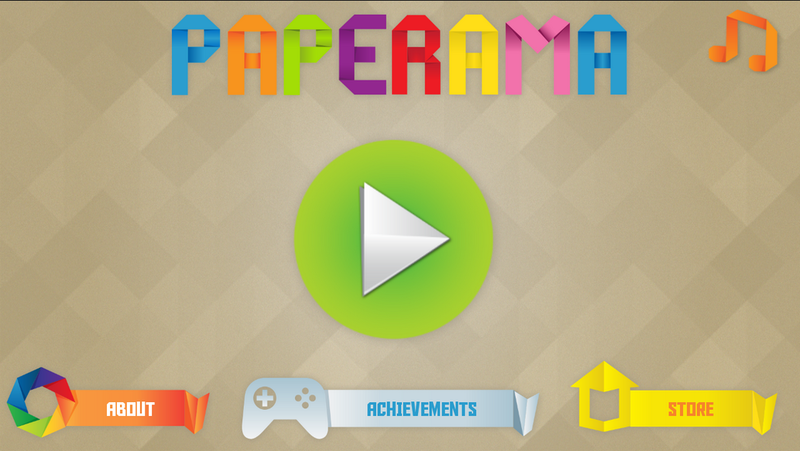 Paperama isn't a multiplayer game, but you can challenge your friends through Facebook and GameCenter for the title of highest score for each level. Having the title among your friends as the master folder for bragging rights adds to the fun. Now that you have some strategies for playing the game, we encourage you to get folding. If you're having difficulty on a particular level, drop us a line on FaceBook or Twitter and we'll try our best to provide an answer for you.